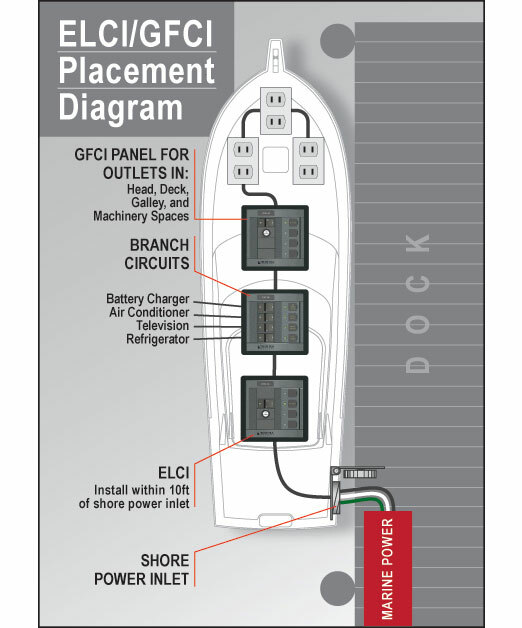 This West Advisor will help you understand Equipment Leakage Circuit Interrupters (ELCIs) and Ground Fault Circuit Interrupters (GFCI), new standards from the American Boat and Yacht Council (ABYC), and how circuit breaker panels equipped with these protection devices can make your boat safer. There are two potential failures in a boat’s electrical system that can put people on or around the boat at risk of lethal electric shock. In a properly functioning marine electrical system, the same amount of AC current flows in the hot and neutral wires. However, if electricity “leaks” from this intended path in these two wires to ground, this condition is called a ground fault. A good example of this is an insulation failure in the wiring of an appliance. In addition, a faulty ground can occur when the grounding path is broken through a loose connection or broken wire. For instance, a shore power cord ground wire may fail due to constant motion and stress. Faulty grounds can be undetectable; a simple continuity test will not necessarily reveal a problem. When these two conditions occur at the same time, the results may be tragic. The combination of a ground fault and a faulty ground can result in metal parts in the boat and under water becoming energized. In addition to the hazard to people on the vessel, there is a larger danger to swimmers near the boat. While people on board are likely to receive a shock from touching energized metal parts, nearby swimmers could receive a paralyzing dose of electricity and drown due to involuntary loss of muscle control. A Coast Guard sponsored study showed numerous instances of electrical leakage causing drowning or potential drowning even though the shock did not directly cause electrocution. Given the seriousness of the problem, ABYC requirements now include specific measures for avoiding this danger. If installed in a head, galley, machinery space, or on a weather deck, the receptacle shall be protected by a Type A (nominal 5 milliamperes) Ground Fault Circuit Interrupter (GFCI). An Equipment Leakage Circuit Interrupter (ELCI) shall be installed with or in addition to the main shore power disconnect circuit breaker(s) or at the additional overcurrent protection as required by E–11.10.2.8.3 whichever is closer to the shore power connection. ELCIs, and the more familiar GFCIs, are part of a larger family of devices that measure current flow in the hot and neutral wires and immediately switch the electricity off if an imbalance of current flow is detected. ELCIs and GFCIs that are also Residual Current Circuit Breakers (RCBO) provide overcurrent tripping protection characteristic of a normal circuit breaker. GFCIs are used as branch circuit ground fault protection at the 5mA threshold in potentially wet environments. GFCIs protect against flaws in devices plugged into them, but offer no protection from the danger of a failing hard-wired appliance, such as a water heater or cooktop. An ELCI provides additional whole-boat protection. Installed as required within 10' of the shore power inlet, an ELCI provides 30mA ground fault protection for the entire AC shore power system beyond the ELCI. ABYC regulations still require the use of GFCIs in environments described above. 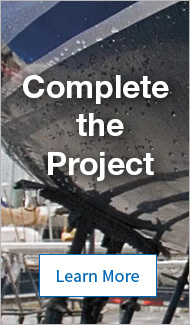 Although ABYC regulations apply only to new boat construction, the dangers and liabilities exist for any boat owner with a shore power connection. Retrofitting an ELCI to an existing AC system can be worthwhile “insurance” against risk. Since an ELCI/RCBO can serve as the main shore power circuit breaker, it can replace a standard circuit breaker in this application. Alternatively, an ELCI/RCBO can be added between the shore power inlet and the existing main shore power circuit breaker. Safety ground system failures on boats are safety and liability disasters waiting to happen. ELCI protection on each shore power line, combined with protection afforded by GFCIs, will reduce risk to those on the boat, the dock, and in the water surrounding the boat. Do not swim in marinas or around docks that are equipped with shore power or around boats that are plugged into shore power. Thanks to Blue Sea Systems for the information in this article. For more on how to protect yourself and your loved ones from electrical shock drowning, go to the BoatU.S Electric Shock Drowning Resource Center.